While bending tests are relatively straightforward in theory, the heterogeneity, geometry, combination of tissues contributing to the plant stem, and abrupt changes in development and anatomy provide a variety of practical and theoretical difficulties. A range of bending tests can be set up for the majority of climbing plant species, but the type of test depends on the diameter and resistance to bending of the material. A bending apparatus that we have used in many laboratory and field situations (Figure 2.2a) consists of a steel frame fixed to a solid base and equipped with adjustable holders that can be positioned at variable distances. A stereoscope binocular microscope equipped with an eyepiece graticule is attached to the base and can be adjusted vertically and focused in a horizontal plane to a fixed point on the plant specimen to critically observe deflection [7,15]. The apparatus can be configured for two types of bending tests: three-point (Figure 2.2b) and four-point (Figure 2.2c) bending. This kind of apparatus can be modified into more portable versions for making measurements in the field (Figure 2.2d). The principal aim of the bending experiment is to measure flexural stiffness, EI, of the stem, and from this quantity calculate the structural Young's modulus, Estr, of the plant stem . 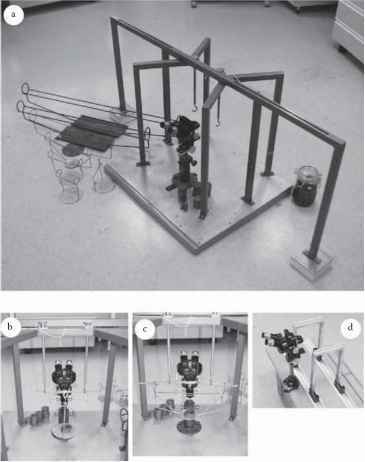 FIGURE 2.2 (a) Mechanical bending apparatus for use in field camps and field laboratories. The methods are entirely mechanical and do not require electricity. Plant stems are placed on supports suspended from a horizontal beam. Span distances can be adjusted to the size and bending resistance of the material. A range of panniers are used for tests in three- and four-point bending (left) as are a series of weights from 10 to 500 g (center). A series of up to six to eight weight increments is placed on the pannier, and the deflections are observed via a dissecting microscope equipped with an eyepiece graticule. The central part of each segment tested is stored in alcohol or FAA (1 part acetic acid 80%, 25 parts formalin 40%, 218 parts ethanol 50%) (right). (b) Configuration for three-point bending. The plant stem is placed on the two supports at a known distance, and the pannier is suspended from the exact center via a plastic ring, which can be turned obliquely to allow observation of the stem through the microscope. (c) Configuration for four-point bending. The plant stem is placed on the two supports at a known distance, and the two-armed pannier is placed on the specimen at equal distances from each central support. With this type of four-point bending, the weights applied to the pannier produce a deflection of the stem in an upward direction, and the influence of shear on the experiment is insignificant. (d) Portable, field, bending apparatus. The plant specimen is placed on the two supports, and the span distance can be adjusted easily. Both three- and four-point bending tests are possible. Plant stem segments are pruned from the plant body and placed in the apparatus configured for either three- or four-point bending. Stems are first checked for splits, fractures, or other damage that could affect their mechanical properties. Stems that taper significantly (more than 10%) and stems that include significantly thickened nodes or branch points are excluded from the study. 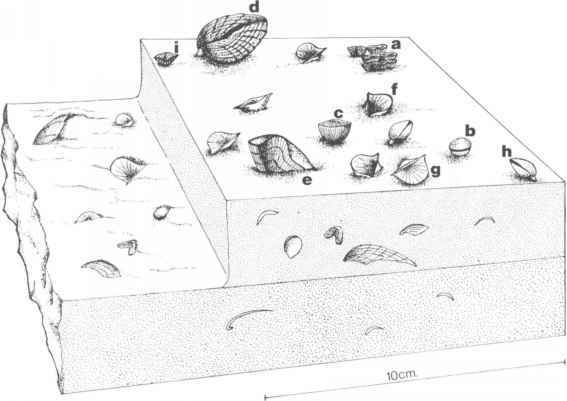 Apical parts of some plant stems such as the leading searchers of lianas can show relatively abrupt changes in mechanical properties from immature tissue near the very apex to the mature, differentiated stem lower down. Tests of young axes should avoid this transition, which is not always obvious from external inspection. There are a number of advantages and disadvantages to both three- and four-point bending. Three-point bending is relatively easy to apply because the weight is added centrally (Figure 2.2b) and the stem does not tend to move about and spoil the deflection reading when the weights are added. In four-point bending, however, the stem is loaded via a two-armed pannier (Figure 2.2c), and slightly irregular stems can twist or flip over after one or more weights are added. This means that it is sometimes difficult to study all of the stem segments of a sample. In three-point bending, because the force is applied and concentrated at one point at the center of the stem, the measurement can include deflection of the axis caused by shear of the plant tissues, thus such measurements would underestimate the flexural stiffness during the bending test [13,14,16,17]. In four-point bending, the force is distributed equally over the central portion of the tested stem, and the effect of shear is insignificant. Tests in three-point bending should be verified to find out the minimum span-to-depth ratio above which the effect of shear will be insignificant. A long length of plant stem is selected, and a series of tests at increasing span lengths is carried out until a span-to-depth ratio is reached at which the flexural stiffness becomes a constant value [15,18]. In a plant stem of, say, a liana, ideally such tests should be carried out prior to measuring stems with widely differing mechanical properties such as young and old developmental stages. Stiff combinations of plant tissues are less liable to shear than more compliant ones. Many references refer to a span-to-depth ratio of 20 as being suitable for three-point bending based on the properties of many industrially tested woods and timbers. This value, however, can change significantly. Some compliant plant materials we have observed require span-to-depth ratios of 40 or more. Four-point bending can also require the addition of quite substantial weight increments to obtain a reasonable deflection in the region of 1 to 3 mm for a range of stem diameters of 1 to 30 mm. Adding excessive weight in a four-point bending test can cause problems because the outer tissue of the plant stem resting on the fixed supports can indent and affect the deflection distance observed; this is especially the case when the deflection is small. Such problems can be addressed by carefully trimming soft bark tissue from around the of the stem's point of contact with the supports so that the support contacts harder wood beneath. But if the wood itself is compressible, the problem might be difficult to solve. In summary, three-point bending is somewhat easier and quicker to carry out, but the need for carrying out span tests can make the approach time-consuming, especially under field conditions. Four-point bending can be trickier to set up and carry out because of movement of the stem, and it might not be possible to measure all of the stem segments in a sample, resulting in a loss in continuity in the analysis. In general, it is best to stick with one or the other types of test for a given analysis on a given plant. Having said that, it is also informative to first test a specimen in three-point bending and then repeat the test in four-point bending, combining this kind of verification with span tests; however, this takes time. Successive weights are added during the bending experiment in three- or four-point bending at fixed time intervals of normally 1 min, which are sufficient for the plant stem to achieve its maximum deflection for a given weight. Creep is sometimes observed when the plant stem continues to deflect and is an indication that sufficient force is being applied to exceed the elastic range of the stem material. Some stems react extremely quickly to the force applied, while others react more slowly. The time increment should take this into account, but 1 min is normally enough to reach maximum deflection.